Type: Softbound, 256pp, lavishly illustrated. ISBN: 978-1903223987, by J. Steve Thompson with Peter C. Smith. Overall Rating: 8 - Marvelous visual discourse on combat aircraft fighting techniques and their history. Neglects its titled intention to provide computer flight simulation training. It's important to say this up front: Air Combat Manoeuvres is an exceptionally well produced book and I'm most impressed. Cover to cover it wastes no space in terms of providing an enormous wealth of knowledge about all aspects of military aviation, notably that of driving fighters. Whether one wants to hear the wind singing through the wires of a biplane's wings, the throaty growl of a WWII single engine fighter, or the afterburner roar of a modern day jet, one will find something in these pages to entertain, amuse and inspire. As the reader leafs through the thick, glossy printed pages, one finds no shortage of presentation styles. 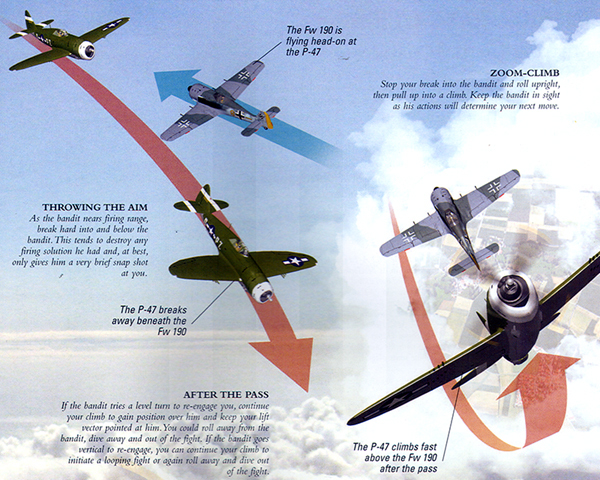 Much of the aviating is depicted in one or two page computer-generated illustrations with plenty of descriptive text. Historical information is presented in an easy to understand textbook style, but in a friendly fashion that is very accessible to a casual or hobbyist reader. There is a glossary of terminology at the front of the book so that one does not get lost in the unavoidable jargon, and a table of aircraft performance characteristics at the end, accompanied by a chatty interview with a sage old fighter jock. The book is well ordered, and takes one through practically all of the flying lessons one might hope for in the course of learning to fly, let alone fight another aircraft or drop bombs accurately. They even teach you how to crash neatly! In fact, there is almost too much information at times. The authors freely mix history and aircraft performance characteristics with the various manuver graphics, and this can get a bit confusing. It forces one to study the diagrams with great care, and to sift the learning experience from the interesting little tidbits. One might suggest that it would have been better to keep these a bit more simple and to the point to be at their most beneficial. The biggest detraction and disappointment comes from the book even trying to assert itself as a computer flight simulation text. That, unfortunately, it is not. It grants only four pages out of 256 to flight simulation, briefly detailing a history of combat flight simulations, a quick survey of PC hardware and peripherals, and finally an essay covering online flying. Each of these topics merits at least one full chapter if they are to be discussed effectively in a text aimed at the combat flight simulation audience. To be sure, the maneuvers flown in real world combat can in many cases be applied to virtual air combat. However, a flight simulator is a computer program, and the translation from zipping around the lofty blue skies in real air to zipping around cyberspace in imaginary air is not easy, nor is it always completely accurate. There are distinct tradeoffs when reducing the abilities of a complex machine like an aircraft to something a computer program can replicate with realism. That's the reality of virtuality. The point of this criticism is that these tradeoffs deserve attention, and in my opinion such attention can only be given if one teaches in the realm of the flight simulator, as opposed to the realm of history, as Air Combat Manoeuvres attempts. 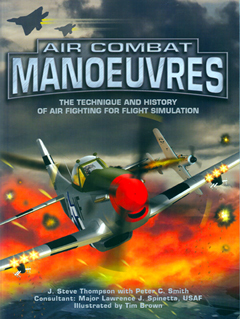 In conclusion, Air Combat Manoeuvres is far more a colorful, artsy collage of military aviation history and technique than it is a serious study text. Its link to anything to do with the flight simulation hobby is casual at best. That exception noted, it's still well worth having on the coffee table. Recommended for the military flight simulation or history enthusiast that wants an artful, in-depth expression of the essentials of combat aviation and its past. This page copyright © 2000 Starship Modeler. First posted on 25 February 2000.